Ohio State has maintained an exceptional reputation for our head and neck cancer expertise for decades, having one of the highest-volume programs in the country. Behind the scenes of life-changing oncology procedures, our ENT specialists are leading the way in research and clinical breakthroughs in a broad range of ear, nose, throat, head and neck problems. The department averages more than 180 cochlear implants and over 200 microvascular head and neck reconstructions per year. For Ohio State College of Medicine students, residents and fellows, more experience means greater confidence, enhanced skills and, ultimately, an increased ability to provide excellent patient care. The opportunity to participate in such a high-volume program, combined with the department's trajectory of growth, brings researchers and clinicians from around the world to Ohio State's dynamic Columbus campus. "We attract the top otolaryngology residents and fellows in the country," Dr. Rocco says. "They could go anywhere, but they choose to work with us." The impact of the Otolaryngology department is readily seen through Ohio State's medical students. This past year, 12 Ohio State students selected and successfully matched into otolaryngology programs across the country. For such a competitive subspecialty, this is an "amazing achievement," shares Dr. Rocco, which he attributes to the quality of Ohio State's medical students, and the outstanding faculty and residents of the department and their commitment to mentoring. In 2018, the department residency program had its best match year ever, matching all four residents from their top seven candidates on the match list with the College of Medicine – rivaling the numbers of Johns Hopkins University School of Medicine and Harvard Medical School. Recruiting exceptional talent in both the clinical and research divisions remains a top priority for the department. Recruiting exceptional talent in both the clinical and research divisions remains a top priority for the department. Unique otolaryngology research and teaching focus keeps patients at the forefront, with vast clinical trial opportunities and streamlined patient care. Through weekly multidisciplinary tumor board screening sessions, Matthew Old, MD, division director of Head and Neck Surgical Oncology, works with cross- functional clinical and research teams to determine patient eligibility for the latest trials. Dr. Old revels in the vision that has come to life for his team on the 21st floor of Arthur G. James Cancer Hospital and Richard J. Solove Research Institute. "We're all right down the hall from each other," he says. "Patients are here, and so are the clinicians and researchers working on their treatments. It's truly unique." Dr. Old says bringing the teams together both physically and collaboratively has allowed for more fruitful patient care, treatment and clinical trials. When Dr. Old isn't researching head and neck tumors and recurrences, he's leading a powerful boot camp- style microvascular reconstruction course for head and neck microvascular fellows. In partnership with Case Western Reserve and Wright State universities, the annual grassroots learning experience brings together more than 30 head and neck fellows from around North America looking for hands-on advanced reconstruction experience with fresh cadavers. "Additionally, we're developing a national resident course to complement the fellow course in the same setting, led by Drs. Stephen Kang and Rod Rezaee," Dr. Old explains. "Otolaryngology residents perform complex surgeries with cadavers – and then the fellows are expected to reconstruct the defects." The two- day course, attended by over half of the Otolaryngology – Head and Neck fellows in the nation, has grown so rapidly it's now recognized and endorsed by the American Head and Neck Society. With ardent faculty and staff camaraderie, a culture of transparency and hard work and opportunities for shared discovery, Otolaryngology teams are setting a new standard for excellence at Ohio State. "The future will bring us even closer together in proximity and practice," Dr. Rocco says. "It's an inspiring time." With accomplishments like these, it's easy to see why The Ohio State University Department of Otolaryngology – Head and Neck rose two spots in the 2018 U.S. News & World Report "Best Hospitals" rankings. Facial Reanimation Surgery Restores Smiles, Natural Facial Expressions – Leslie Kim, MD, MPH, director of Facial Plastic and Reconstructive Surgery, is restoring smiles, natural facial expressions and self-confidence for patients with facial nerve injury and inflammation with resultant facial muscle atrophy. A multidisciplinary facial reanimation surgery program is taking shape at The Ohio State University Wexner Medical Center and Nationwide Children's Hospital to address both congenital and acquired facial paralysis. New Study on Kids with Cochlear Implants Is First of its Kind – Irina Castellanos, PhD, assistant professor of Otolaryngology, is investigating how delays in language and executive control impact psychosocial development in preschoolers with cochlear implants. Guided by a passion to better understand how hearing loss affects kids, she received a three-year, $300,000 grant from the NIH. New Genomics Tool Could Help Predict Tumor Aggressiveness, Treatment Outcomes – James Rocco, MD, PhD, and his colleague Edmund Mroz, PhD, research associate professor of Otolaryngology, developed a new method for measuring genetic variability within a tumor that might one day help oncologists select appropriate therapy to improve patient outcomes. Using a new scoring method they developed called MATH (mutant-allele tumor heterogeneity), they can go beyond traditional staging to identify when to use radiation or chemotherapy treatments after surgery. Research Explores Cognitive Functions and Outcomes in Adult Cochlear Implant Recipients – Aaron Moberly, MD, assistant professor of Otolaryngology, will spend the next five years exploring variability in speech recognition outcomes among adults with cochlear implants. 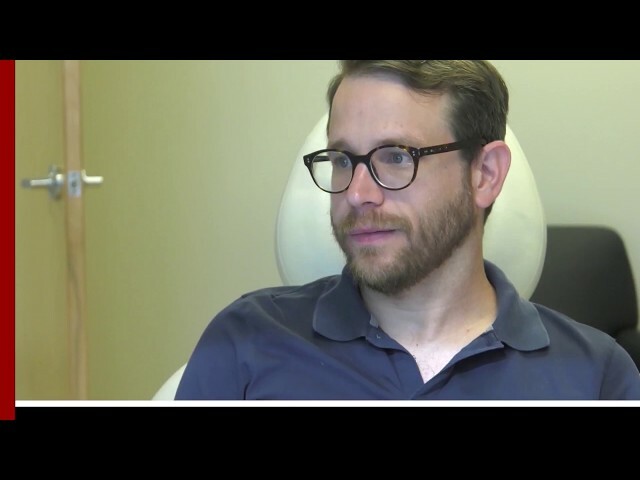 Aided by a $900,000 grant from the NIH, he aims to discover the reasons why one patient with a cochlear implant adapts well, while another patient with the same device struggles. Renowned Vestibular Scientist Joins Ohio State and the Navy's Aeromedical Research Unit – Daniel Merfeld, PhD, professor of Otolaryngology, intends to help reduce morbidity and mortality associated with vertigo, imbalance, spatial disorientation and other symptoms of vestibular dysfunction. Dr. Merfeld transitioned his research to Ohio State from Harvard in 2017, bringing three NIH grants. He's also been named senior vestibular scientist for the Naval Medical Research Unit Dayton, the Navy's aviation-related medical research program housed at Wright-Patterson Air Force Base. Surgical Precision in Skull Base Tumor Removal – Daniel Prevedello, MD, director of Ohio State's Minimally Invasive Cranial Surgery Program, and Ricardo Carrau, MD, otolaryngologist/head and neck surgeon at Ohio State's Comprehensive Cancer Center –James Cancer Hospital and Solove Research Institute, are revolutionizing the removal of skull base tumors. Blending minimally invasive robotic surgery with endoscopic endonasal surgery, they're removing such tumors through the nose or mouth, reducing adverse facial effects for patients. "We have incredible faculty, and it's impossible to take credit for their desire to achieve," Dr. Rocco says. He believes his highly sought after fellows are the mark of a great program. "Our team is excited about our new position but, at the same time, we're not satisfied and will strive to continue to grow," Dr. Old says. "We have high expectations of ourselves and others, and our teams are always looking to serve the greater good and improve."